Honors students meet with each other for a mentorship program. 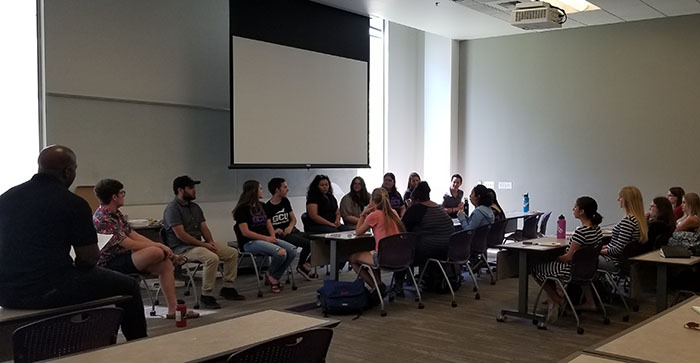 That’s about all one of the freshmen at the Honors College mentorship meeting at Grand Canyon University could muster. The Freshman Leadership Initiative to Gain Honors Tenacity, (FLIGHT) mentorship program brought together Honors students at every level, from majors across the board. It was the kickoff event for a semester’s worth of one-on-one meetings between the students paired with each other. “FLIGHT started as a way to ensure that our honors freshmen feel supported and connected right from the start,” he added. Teresita Figueroa, a senior pre-med major, was paired with freshman Hadassah Gates, also studying pre-med. Figueroa has amazing experience in the field to help mentor Gates. For the past seven years, she has volunteered at a hospital in various departments, forgoing paid positions so she can immerse herself in the field. Figueroa said she decided to be a mentor because of the positive impact her mentors had on her. Gates said meeting Figueroa and the other mentors helped her lessen the stress of starting college. Gates said GCU as a whole has made her feel completely supported so far. There are two more FLIGHT events this semester, on Oct. 26 and Nov. 9, where students can connect and go on to meet one-on-one with a mentor. Honors students can email Williams at Dennis.Williams2@gcu.edu to learn more. 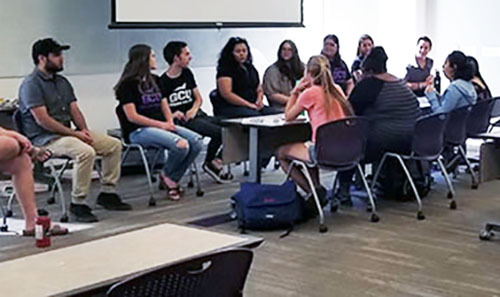 GCU Today: Collegiate Scholars chapter grows to largest in U.S.